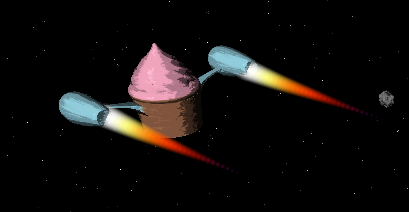 Sorry about the lack of a post last week, anyways, this week I will be talking about trail effects in Galactose. 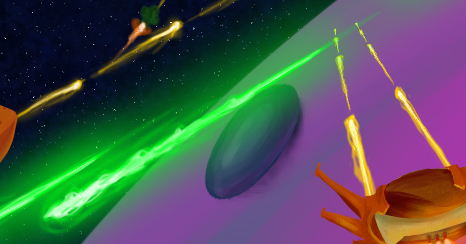 Overall, Trails are one of the effects that most expresses the visual style in Galactose. 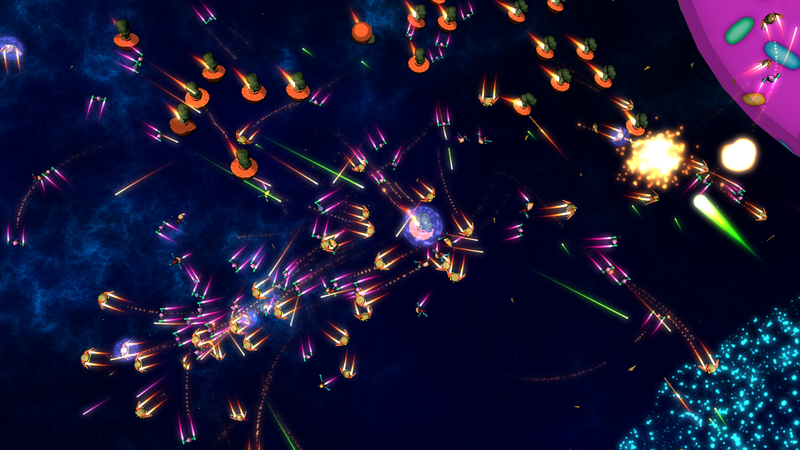 We use trails for projectiles and behind ships. They are also something that has gone through a large number of revisions. This week I'll take you through their history and explain a bit about their implementation. As a side note, I always thought the orange shot effect looked pretty cool. Anyways, this was the state of the trail effects on January 28, 2011. It should be noted that this is long before many game systems such as .obj file loading were implemented. But, here, you can see the genesis of how we implement our trails. 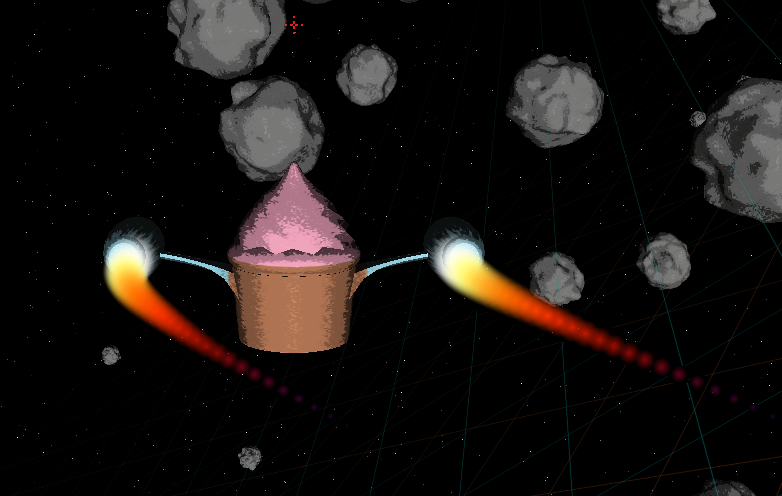 Basically, we abuse additive blending and the geometry shader. 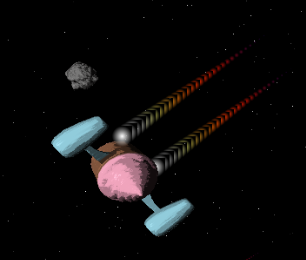 The coloring is based on a cool strategy I implemented in a homework assignment for a computer graphics class, in order to make my particle system much cooler. 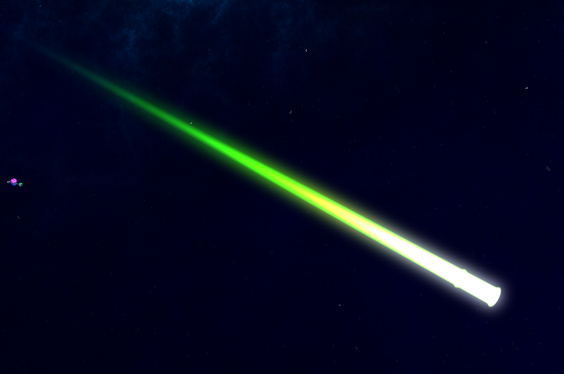 The Individual particles of the trails are pretty simple to render. First, we decide their color with the coloring strategy above, then, per-pixel, we decide on the opacity based on how far the pixel is from the center of the particle. We could have done this last part with a texture lookup, but I've found that it also works pretty nicely to just use the distance formula and pick their opacity procedurally, which was a strategy I came to like after taking Procedural Shading. Anyways, the other part of our trail system is that we keep track of a series of points where the trail emitter has been recently, and use the geometry shader to interpolate a number of small quads between those points, which are then additively blended together to produce the trail visual. 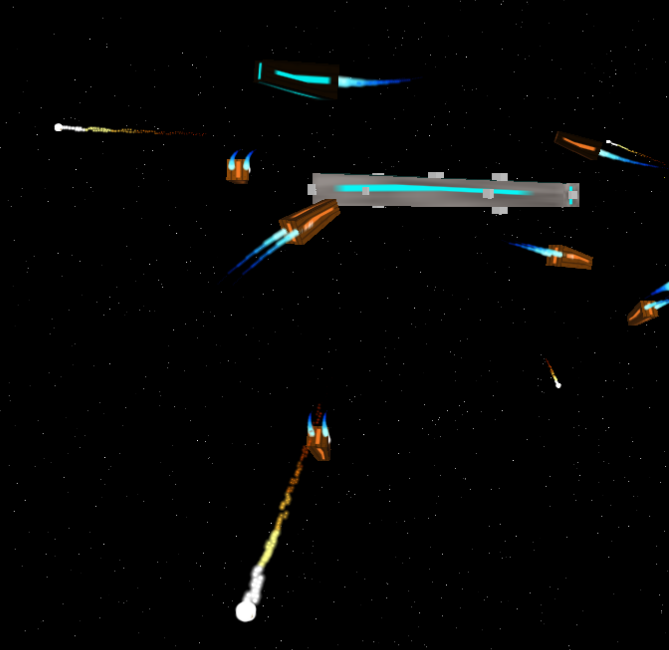 For different trail quality levels, I adjust the number of trail particles, so if you turn down the quality, you might start to see the individual particles more, and the gaps between them, which will tend to look something like the "Player ship's trail" image above. But isn't this expensive to render, you ask? Well, that actually depends. On decent discrete modern graphics cards, it runs pretty smoothly, but for something like a really old integrated Intel graphics card, it is kinda a problem, so we use a slightly different approach for our "ultra low graphics" mode. Normally, you probably wouldn't notice the distortions visible above, it took me a few minutes to find the right direction to view it from; Anyways, for ultra-low-graphics mode, we "cheat" for distant trails, and render the trail with 3 polygons - two at a cross-section to give the length of the trail, and two cross-sectional slices which help hide the effect from the front and the back (you can see those cross-sectional slices as the two "bumps" in the above image). 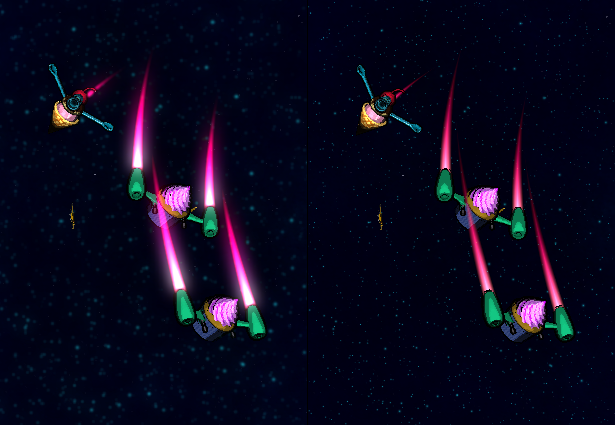 Overall, this actually comes pretty close visually to the most important cues about trails, but it creates trails that are very "rigid" and which can't express trajectory at all, instead, they stiffly point right behind the "emitter", in a straight line. 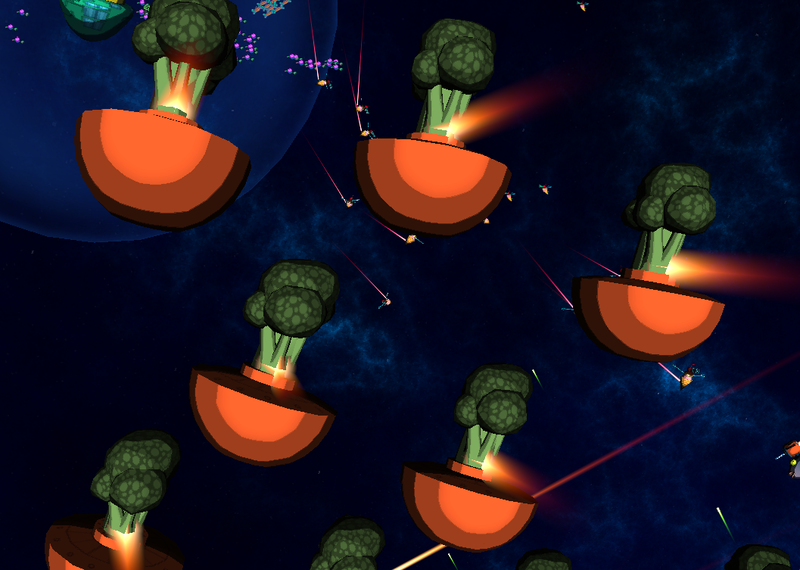 Its perhaps easier to see whats going on with the broccoli bombers and the glow effect turned off. Notice the cross shaped sections above. 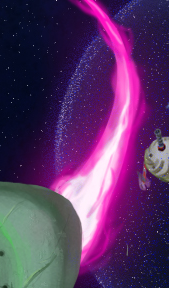 The reason you can notice the trails on these ships is because the cross sectional slice is occluded by the back of the broccoli ship, and with the glow off, its also much easier to see. Anyways, if you don't look too closely, it looks like a very similar effect to the "nice" trails, but at a much lower rendering cost. With a few more months of tweaking and minor improvements trails began to look event better. Anyways, for the "glow" effect, we basically render to a lower-resolution off-screen buffer, then blur that a few times and then blend it back into the final image. We use an approach probably not all that different from the one described in GPU Gems 2. 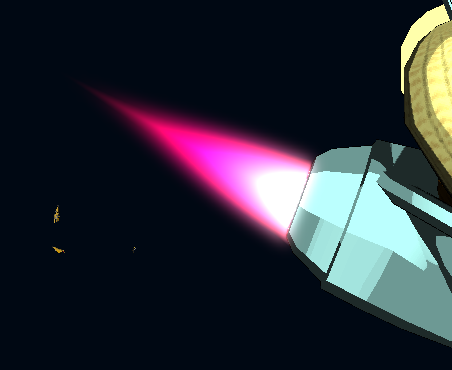 Instead of a glow texture, we render the effects which want a glow effect normally and then use that. We also use a somewhat different implementation since we're not as constrained by the shader language as they were back then. There are always things to improve. What I'd like to improve the most is to make the trails look less smooth and more chunky, like you see on the background of the start screen. I haven't quite figured out how to do this yet, but I think it would really take the visual polish to the next level. 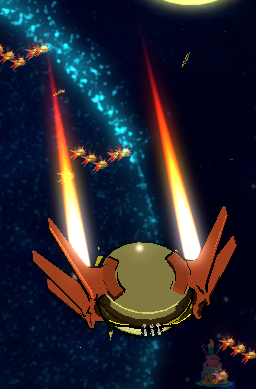 I still think the trails on the enemy ships are probably my favorite trails, I really like the "fiery" impression they give off. Thanks for reading my long winded post about trails.